Build your ultimate vacation album and we'll find YOUR perfect cruise. Use these icons to navigate and track your progress in the current topic. Don't know which cruise is best for you? Simply like some of these pictures and we'll suggest your perfect cruise match. It's as easy as that. By liking or disliking a few features, the Cruise-Finder will find cruises that match your individual preferences. After the first answers you have the option to “See results” and to optimize our recommendations by liking or disliking sailings. It’s all about you, so have fun! Use the top icons to navigate and track your progress in the current topic. If you don’t like the feature, click here. If you like the feature or experience, click here. See your total progress over here and find your results. feature or experience, click here. It can be extremely difficult these days to find a cruise that matches your needs, wants, and style. Budget-conscious cruisers may be worried about missing out on the top cruise deals and paying too much, families may worry about finding family-friendly or kid-friendly entertainment programs on board, while others may simply be looking for a luxurious vacation where they can be pampered and taken care of for a change. However, with millions of sailings available and prices fluctuating all the time, finding the right cruise can be stressful and time-consuming. So what do you do? Thankfully, there’s now a free tool designed specifically to help first-time cruisers or travelers who want to experience something new and different but aren’t sure where to start discover the cruise that’s right for them. Here’s everything you need to know about the innovative new Cruise-Finder from Cruisewatch! No, we’re not trying to set you up on a date with a cruise ship. But the Cruise-Finder is designed to be intuitive and easy to use, and, like Tinder, will match you with a sailing based on a percentage of preferences that match. Who is the Cruise-Finder for? While anyone can use this helpful tool, it’s designed specifically with first-time cruisers in mind. We know the struggle of trying to find affordable cruises firsthand, and in our efforts to level the playing field and create market transparency, we decided the search process needed to be streamlined. One of the best things about the Cruise-Finder is that it provides new cruisers with a starting point, from which they can further refine their cruise search if necessary, or take advantage of the great cruise deals and sailings they match with. If you’re a first-time cruiser it can be tough to know how to find a cruise in the first place, let alone how to pick a cruise that matches your needs and wishes. That’s where the Cruise-Finder comes in! Regardless of whether you care more about luxury or price, cruise ports or onboard activities and entertainment, it’s easy to meet your match. When you picture your perfect cruise, what images come immediately to mind? Do you imagine yourself lounging by a pool with a good book and a drink? Do you see yourself luxuriating in a spa with a couple’s massage or exfoliating treatment? Or do you picture yourself having some time to breathe while the kids tire themselves out with action-packed playtime and tons of kid-friendly activities on a family cruise? Whatever image you have in your mind’s eye, hold on to it when you’re planning your ideal cruise vacation. The first important piece of information the Cruise-Finder will need is which port you would like to depart from. Most often, this will be the port that’s closest to where you live, although it could also be somewhere far away in a place you’ve always wanted to visit. Your departure port choice is an important initial filter - the Cruise-Finder will immediately narrow its search to sailings departing from your chosen location. Remember how we said the Cruise-Finder was like an online matchmaking service, but for cruises? Not only does that mean we use your preferences and cruise data to match you with the sailing that’s best for you, it also means that the process of choosing your preferences is more fun, intuitive, and engaging than just filling out a profile. You’ll be shown 15 inspiring “mood” images with a short description of a certain cruise style - for example, “I need great kids programs for the little ones.” If that matches your needs, tap or click the heart icon. If not, choose the “X”. Each picture corresponds to a different aspect or category of cruise travel, from dining to entertainment to shore excursions and shopping. If you need to readjust your answer, you can always go back through our navigation icons at the top (e.g. click on “Departure”) and change it. You’ll also be able to set your preferences on cruise ship size (small ships tend to be more intimate and offer fewer amenities but more immersive itineraries, while larger ships have tons of onboard entertainment and more sea days). If you have a schedule to consider, you can also determine your preferred cruise length, from shorter to longer. Your budget is another key component in finding the right cruise, and the Cruise-Finder will also take that into consideration. If you’re still not sure, don’t worry - these filters are estimates. If you have absolutely no idea, you can also skip that question and either return to it later or simply move on. On the other hand, you can also click on “Show Results” after you answered the first couple of questions to get a first look at sailings that match your preferences. You have complete control over how much information you provide and how much time you want to spend refining your results! True to its name, once you start selecting the experiences you want to have on your cruise, the Cruise-Finder starts finding you sailings that offer those experiences. 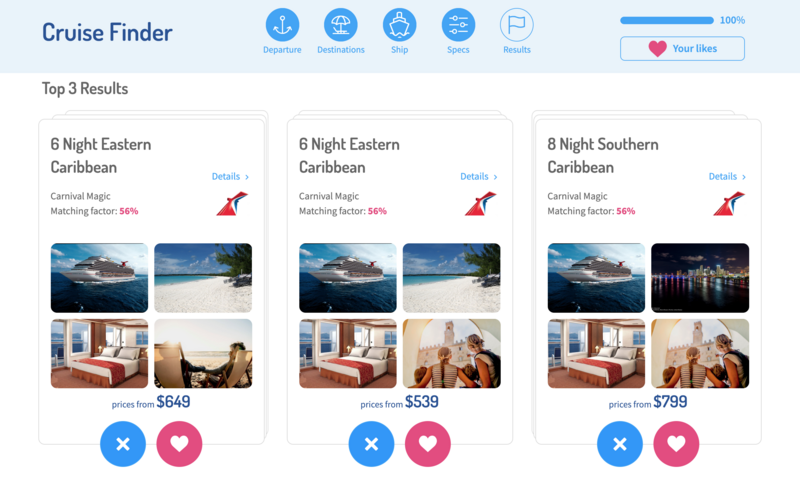 Thanks to its innovative, data-backed, artificial intelligence-powered design, the Cruise-Finder is able to learn from your choices to offer super personalized, optimized results. An important note: The Cruise-Finder will only show you results that have a high match factor percentage to you. If your choices don’t match any existing cruises or the matching factor is not high enough, the Cruise-Finder will simply ask you to adjust some of your criteria. Initially you’ll be shown your top 3 results, but you can refine these by choosing whether you “like” or “dislike” each sailing. You can also choose to save the Cruise-Finder results in your free MyCruisewatch account. Simply log in or sign up with your email address to save the results to your account, track prices, and set up alerts to be notified when prices change on your favorite cruise. Once the Cruise-Finder displays the results of its search, you can further refine the results by choosing the heart icon or the “X” again. Each sailing is displayed in the form of a cruise tile, with important information clearly available at a glance, including match factor percentage, price per person per night, cruise line, cruise ship, and cruise length. As you further refine your results, you’ll be able to see other options and sailings that offer a different blend of services and experiences. If you want to learn more about a specific sailing, click “Details” in the upper right corner of the cruise tile. The tile will flip around to reveal additional information on the sailing, including quality rating, itinerary, and a breakdown of prices by cabin type, as well as a historic price graph. If you want even more details, click the “Details” button at the bottom of the tile to visit the cruise details page. In this case, the top 3 results include a 5 Night Middle East Cruise on Royal Caribbean’s Quantum of the Seas, a 7 Night Hawaii Cruise on NCL’s Norwegian Breakaway, and a 5 Night Western Caribbean Cruise on Norwegian Breakaway. 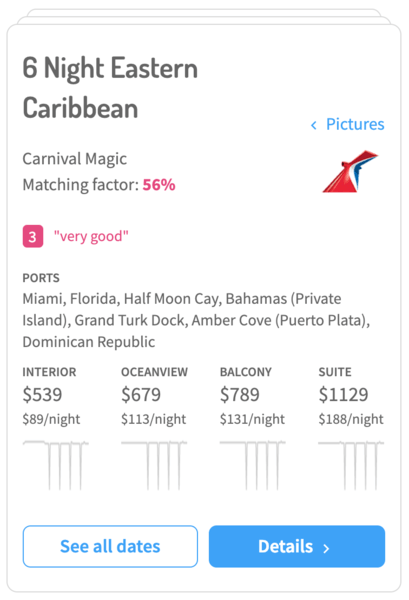 As you can see, the prices are clearly stated, as is the match factor percentage, and each cruise tile includes some of the mood images the cruiser picked. By clicking on the “Details” link in the top right corner of the cruise tile, additional details are shown. In the example to the right, it’s clear that the cruise will visit six ports during the weeklong cruise. That means that there are likely to be fewer sea days and more opportunities to play in the sand and surf and explore these awesome ports. Interior, oceanview, balcony, and suite cabin prices are also visible, along with a historic price graph that shows how often prices fluctuate for each cabin type. The total price shown is per person, while the price per person per night is also clearly displayed. We know that the cruise market is saturated with amazing new offers and deals, and that while too many choices is a good problem to have, it’s still a problem. Narrowing down the search for that special cruise can take a lot of time and effort. In fact, our own research shows that 40% of Cruisewatch users actually spent upwards of 15 hours searching for their last cruise! We think you’ll agree that time could be better spent, which is one big reason we created the Cruise-Finder. Unlike other search engines or tools, the Cruise-Finder learns from your choices and refines the results it shows based on your usage. It’s almost like having a travel agent in the palm of your hand, or sitting with you at your personal office, helping you find exactly what you’re looking for. If you’ve never taken a cruise before, you may not know what to expect. The Cruise-Finder takes you step-by-step through different experiences you can anticipate having through both pictures and statements. Simply choose whether you agree or disagree with the experience, feeling, or style provided, and the Cruise-Finder does the rest. At the end of your “consultation,” not only will you have a better idea about which sailings match your preferences, you’ll also know what those preferences are. Set your preferences with the click of a mouse or the tap of your finger. The Cruise-Finder intuitively logs your choices and learns from them to show you clear and concise results. All important information on each sailing is also displayed in cruise tile format, easy to understand at a glance. From family cruises aboard Disney Cruise Line to fun under the sun with Carnival Cruises, from gourmet dining on Norwegian Cruise Line to awesome excursions with Royal Caribbean, you’ll be able to see what awaits you on your cruise vacation. You may not be able to sail for free, but you can do the next best thing! We’ve developed the Cruise-Finder to make it simpler than ever to find the sailing that’s right for you. We offer this resource for free in keeping with our goal to create market transparency and really level the playing field between cruise lines and consumers. Because of that goal, we also don’t want to push you into making a decision before you’re ready. Use the Cruise-Finder as often as you like - we’ll never muscle you into buying a cruise or paying anything. In fact, the more you use it, the better it will get, thanks to self-learning AI-powered algorithms designed to offer you the best-tailored results possible. Maybe you’re looking for more advice or maybe you just like to know all your options before you make a decision - regardless, we’ve put together a huge database of top tips for new cruisers. Based on in-depth research, first hand experience, and industry expertise, our library of advice for first-time cruisers offers a wealth of knowledge you can use to make the most out of your cruise - including how far in advance of your departure dates you should book, what services cruise lines offer, and which are the most fun ships in the industry. If you’re looking for more personal advice, be sure to sign up for your free MyCruisewatch account to receive tailored newsletters directly to your inbox. Get the latest data-driven money saving tips, cruise hacks, and more. Plus, be sure you’re getting the best possible price by activating a price alert on your favorite sailings so you can be notified as soon as prices change. Your next adventure awaits, and it may be closer than you think. Get started by trying out the Cruise-Finder today, and start exploring your future in cruising! Have questions? Drop us a line any time at info@cruisewatch.com.